Because the words “lead” and “leader” are frequently overused, they tend to lose their meaning and simply become words which connote some sense of superiority and status. By contrast, the New Testament uses these words more carefully, giving them a fresh and often contrasting meaning. Leadership is a case in point. We have to pay attention to the context in the New Testament to see how biblical leadership differs from leadership in the world. The Purpose Of Leadership A familiar picture which Jesus uses of Himself (Jn. 10:11), and which the Bible applies to the leaders of the churches, is that of the shepherd. In his address to the elders of the church at Ephesus Paul wrote: “Therefore take heed to yourselves and to all the flock, among which the Holy Spirit has made you overseers, to shepherd the Church of God which He purchased with His own blood. For I know this, that after my departure savage wolves will come in among you, not sparing the flock. Also from among yourselves men will rise up, speaking perverse things, to draw away the disciples after themselves. Therefore watch, and remember that for three years I did not cease to warn everyone night and day with tears” (Acts 20:28-31). It is clear that the purpose of leadership in a church is directed to the wellbeing of those gathered together. Feeding on God’s Word is essential, since without this there can be no growth. Addressing God’s people by preaching is essential, but it should be followed up with personal, informal discussion. Without this, the ministry of the Word is less fruitful. When we read the gospels we see how often the Lord questioned the disciples and they Him. We cannot assess the condition of younger believers unless we engage them in friendly discussion. And what better place for this than in discussion around a table? We should take Malachi’s words to heart: “Then those who feared the LORD spoke to one another, and the LORD listened and heard them; so a book of remembrance was written before Him for those who fear the LORD and who meditate on His name” (Mal. 3:16). Moses wrote something similar, so this was not a new idea of an obscure minor prophet. It was a serious word for Israel, and for us as well: “These words which I command you today shall be in your heart. You shall teach them diligently to your children, and shall talk of them when you sit in your house, when you walk by the way, when you lie down, and when you rise up” (Dt. 6:6-7). An aspiring elder may have a diploma from the best Bible college, but that alone will never make him a leader in the church. Writing to Timothy, Paul described the sort of men who ought to be marked out for church leadership. They should be above reproach, and respected by nonChristians in the community. They must have a loving and fruitful family life, their children being obedient and growing in their relationship with the Lord. 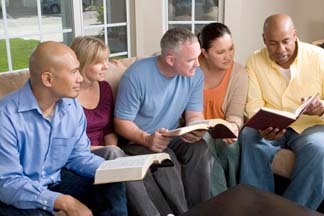 They must be mature, and since they are to feed the flock they must also know the Scriptures. We further suggest that the virtues of hospitality, kindness, selfcontrol and wisdom characterize them as well (1 Tim. 3:2-7). Godly leaders will not want wealth or status, nor will they want to rule or to control. They must lead by example. Without this all else is wasted effort. Moses was brought up as a Prince of Egypt. Some think the throne was within his grasp but he, “chose rather to suffer affliction with the people of God than to enjoy the pleasures of sin for a season” (Heb. 11:24-26). For 40 years the Lord had him tend sheep so He could train him to shepherd His people and lead them towards their promised land. The training principle here is that we learn to “forsake the world” and guide those entrusted to us to the heavenly kingdom. God entrusts us with small tasks and, as we fulfill these to His satisfaction, we are entrusted with other, more difficult and responsible ones (Mt. 25:21). It ought to be clear that being “over” others, in the sense that the world would understand it, is not for the Christian. James and John wanted places of honor in the coming kingdom. Their mother even came to the Lord and requested this on their behalf. As so often the case this was an opportunity for the Lord Jesus to make things crystal clear and to avoid any misunderstandings in the future. The other disciples were indignant at this, suggesting that they too had not been unaware that there might be possibilities for promotion. Jesus explained here the relations in this life and in the future kingdom. As for the future, that is for God to decide; and it need not worry us at this present time, since our function is only to serve. “You know that the rulers of the Gentiles lord it over them, and those who are great exercise authority over them. Yet it shall not be so among you” (Mt. 20:25-26). Jesus continued to show that the values of the world are not the values of His kingdom. Indeed those values which men live by are turned upside down by His rule and kingdom: “Whoever desires to become great among you, let him be your servant. And whoever desires to be first among you, let him be your slave – just as the Son of Man did not come to be served but to serve, and to give His life a ransom for many” (Mt. 20:26-28). Before real authority can be given to us we have to deny ourselves and learn to serve. To be worthy of great honor we must not just serve but actually reckon ourselves slaves, not only of the Lord but of all our brothers and sisters in Christ. Indeed we must even be prepared to serve those who are not of the household of faith. It is only in this way that we are truly identified with the Lord Jesus. It is only thus that we truly become like Him. That is what we are called to, and what we are called for. To serve as the Lord served, with a character like His and conformed to His image (Rom. 8:29).